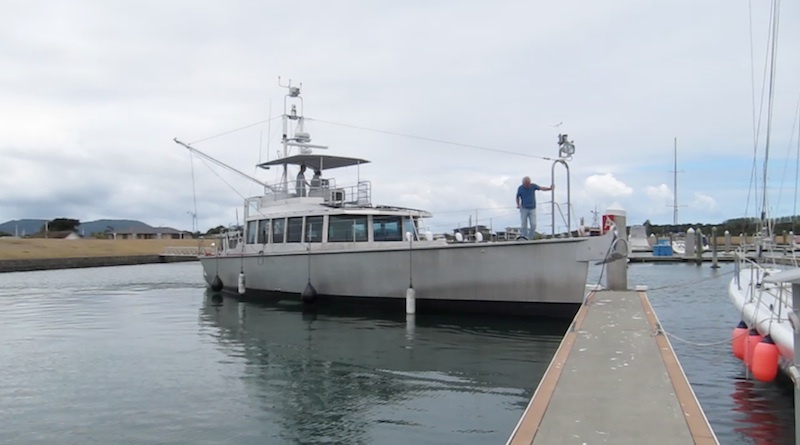 The following posts give details about various sea trials with the first FPB 64s. 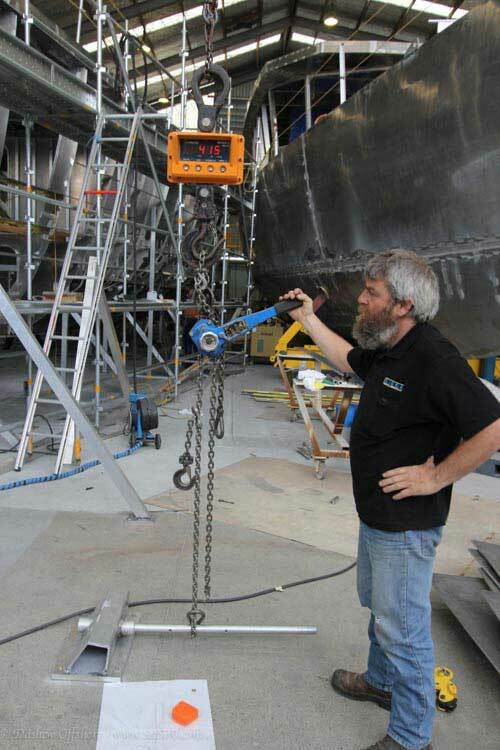 These photos show testing of Osprey’s swim step extension in dive mode. We have updated the post with a short video at the end which you may find refreshing. 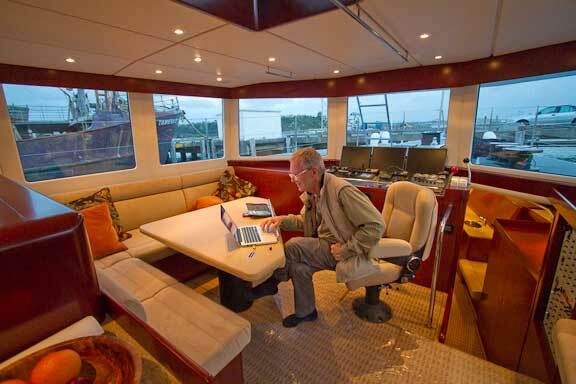 Here’s a sight that would gladden the heart of anyone interested in cruising yachts. Two FPB 64s, Iron Lady and Osprey, side by side in Marsden Cove Marina. While we were a little busy last week we still managed a few photos, which follow. At the end of this article you will find a link to a high res slide show which has full-sized high def images, of these and other details. Landing at Whangerei International Airport news awaited that the long spell of pleasant New Zealand weather had finally broken down and strong gale to storm force winds with heavy rain were forecast, exactly what we had asked Circa Marine to arrange. As you can see from the lead photo, these new seas, onshore in angle and so reflected back, were steep and confused. A perfect day for testing. Note: at the end of this blog is a short video. 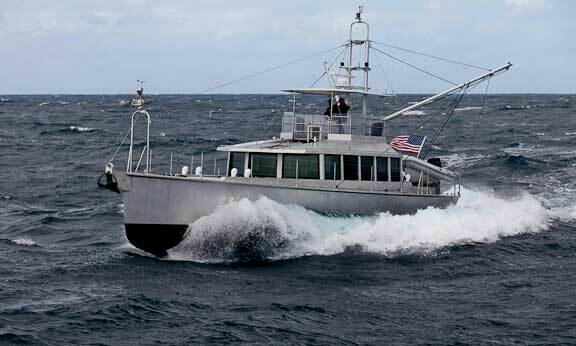 We have been studying the motion of FPB64-3, Iron Lady, with an eye on what we are doing with the FPB 112. The difference uphill, between this and the previous 64s which do not have the swim step extension gives us some wonderful data. We shall shortly see how this works for ourselves, but for now we have to be content with video. We have the complete set of data now from Circa on Iron Lady’s second set of runs. The data looks as expected for her displacement running in deep water and calm conditions (numbers are on the next page). She also appears to be a touch quieter, although without soft goods installed this is difficult to tell for sure. 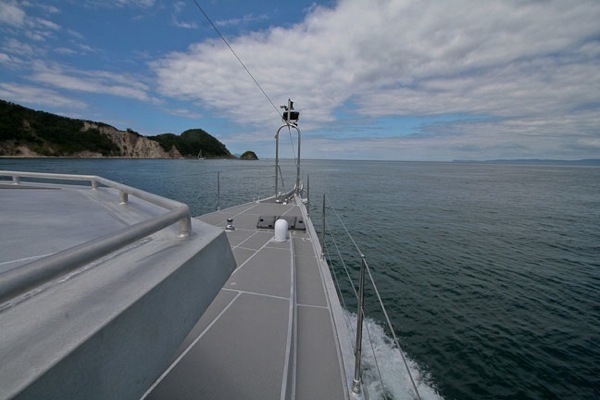 The second day of sea trials for Iron Lady has come and gone with unfortunately calm conditions. However, this is a chance to get deep water data and put some hours on the systems. She us running in these photos at 10.4 knots, turning 2000 RPM, with a pleasingly clean wake. There are a series of photos following, perhaps providing a degree of solace for Steeler fans. We hesitate to give out early performance information, but since the preliminary data off yesterday’s runs with Iron Lady are in the ballpark for what was expected, we thought we’d give you an early look. 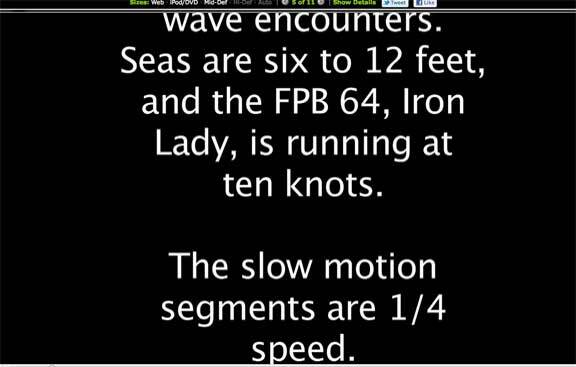 Iron Lady displaces roughly 34 metric tons / 75,000 pounds, in these early runs, as as she has a bit of fuel and water onboard. There were two runs, one up and one down tide, and these were averaged. 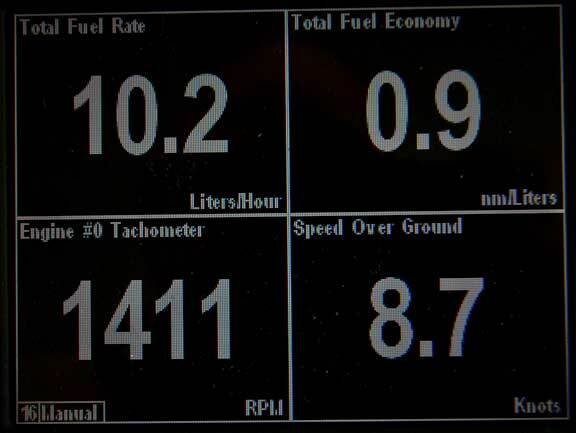 Speed is from the GPS, fuel burn from the John Deere CPU display. Water is brackish and a touch shallow, both of which retard performance. The engine is a 235HP John Deere six cylinder diesel. The basic dock check having been completed and stabilizers initialized,its time to see what she’ll do. The series of photos which follow have Iron Lady at about 34 metric tons / 75,000 pounds. She is doing approximately nine knots (instruments are yet to be zeroed in). 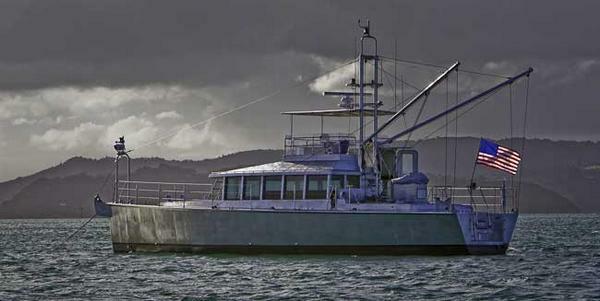 Let us introduce you to FPB 64-3, Iron Lady, about to start her sea trials. 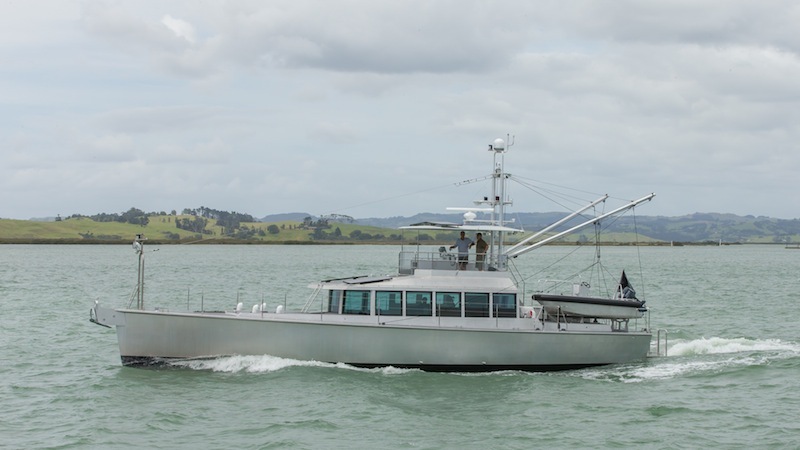 We are happy to report that another FPB 64 has been launched in New Zealand. 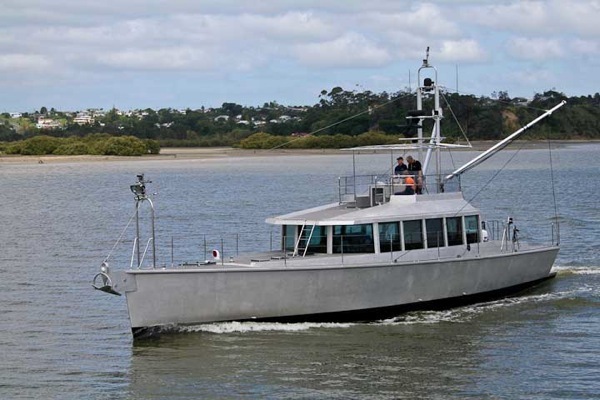 Osprey was built under survey, to Australian regulations so she can be chartered. 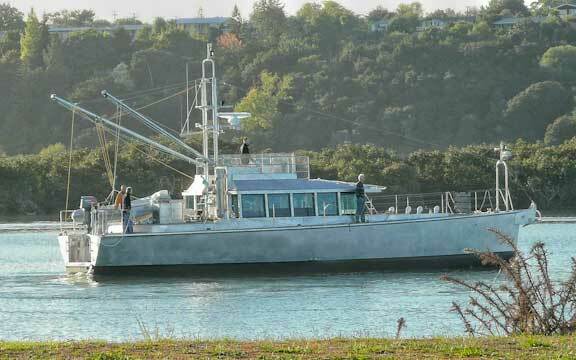 In spite of the additional survey requirements, much of which is driven by rules designed for different types of vessels, she has hit her empty weight targets. Circa have sent us some initial fuel burn, speed, and engine loading data for the second FPB 64. 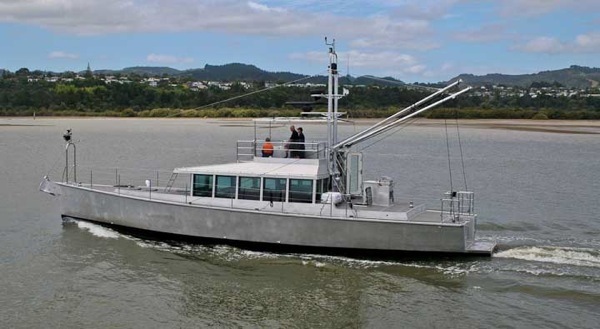 This information was collected with the boat at about 80% payload, in light winds, and shallow water of the river that runs into Whangerie. If you are just joining us, and are looking at the FPB64 Avatar Final Trial photos for the first time, we suggest you take these blogs in order. You will find at the end of each blog a link to our high res photo server which will allow you to view these remarkable photos full screen. Links for the three articles, in order, are below. Part two will be found here. For the associated slide shows, with versions of the photos that will play full screen, see the links below. Part one slide show is here. Part two slide show is here. Part three slide show is here. 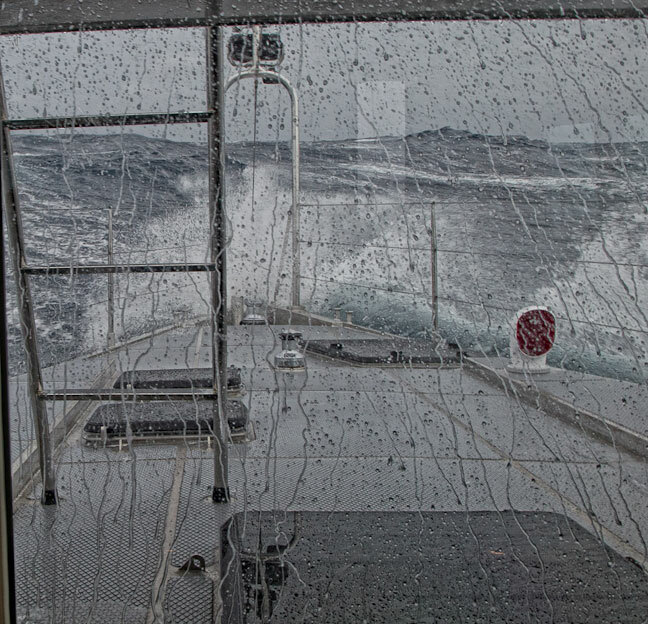 While the first set of Final Trial photos represented the worst of the conditions, in the real world, even in gale force winds, you don’t encounter an unending succession of such seas. This next set of photos, taken during the same shoot, represent more of a norm. We’ll start with downwind, since that is clearly the most fun. We’ve now received a few selected images from Ivor Wilkins in high resolution (the source files are 60mb each! ), so we are able to crop in really tight and dissect what is going on. We’ll start with this shot and look at the bow and stern a little closer (if you are just joining us there are two preceding blogs which should be read first. At the end of each is a link to a slide show that will allow you to study these photos full screen). 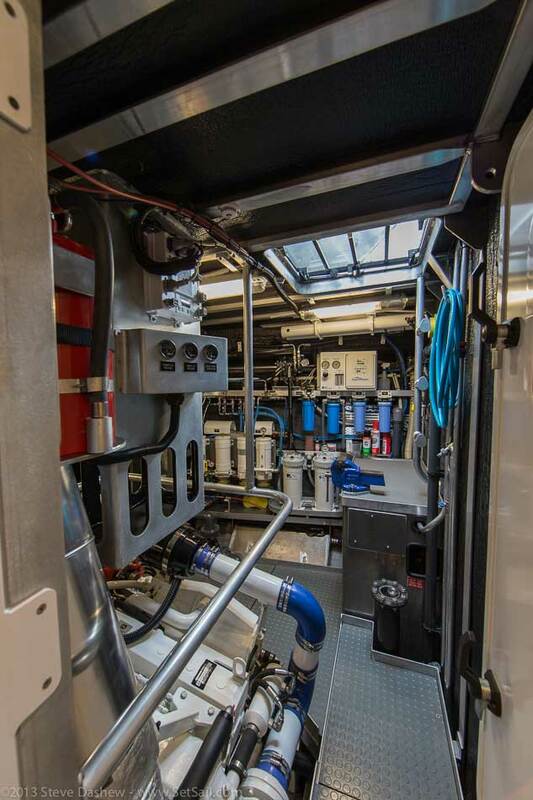 We are two weeks removed from sea trials on the FPB 64, Avatar, the Arizona desert is abloom with spring foliage, and the reality of the FPB 64 is slowly coming into focus. There are all sorts of ways of calculating fuel burn and range under power. 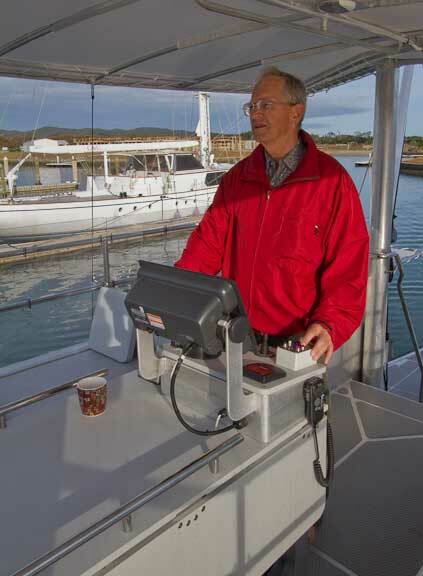 You can use just the power requirements of the boat, add in (or not) requirements for electrical and hydraulic, consider adverse weather (or assume smooth water), and allow for the boat getting lighter as it burns its fuel load (or keep it heavy as a fudge factor). 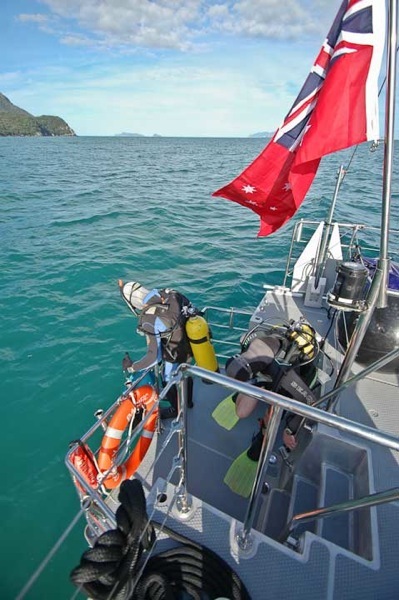 The data we presented in the previous post was based on smooth water and no wind. We’ve now massaged this further to show range with different allowances. 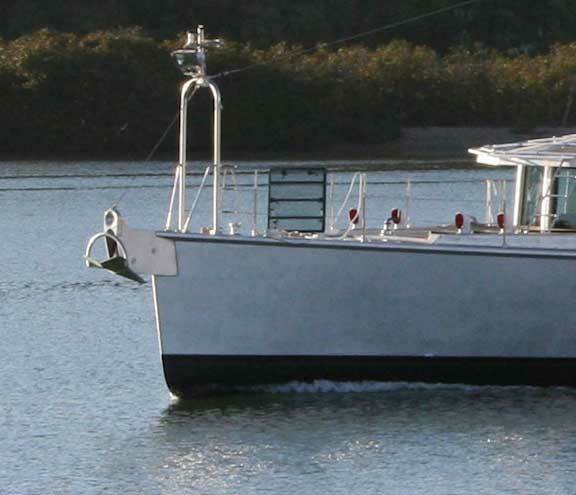 One of the design aspects which requires careful attention is the water flow towards and then off the stern. 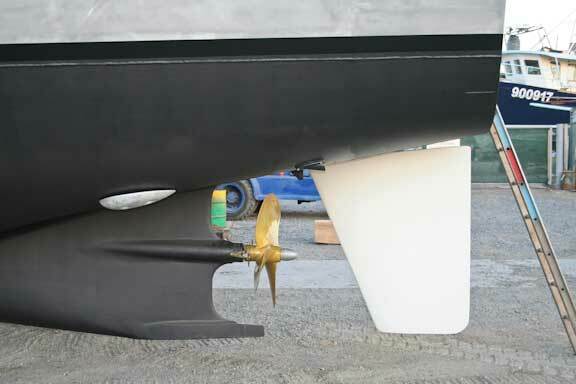 A hull like the FPB 64 can handle a certain amount of immersion of the transom and still be efficient, but if the water release isn’t clean excessive drag is the result. 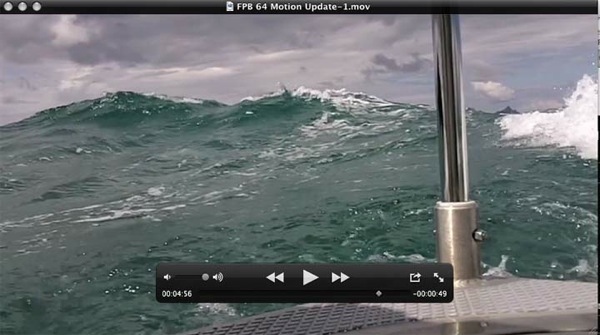 The photos in this blog were taken at full load, running at 1600 RPM at about 9.5 knots. 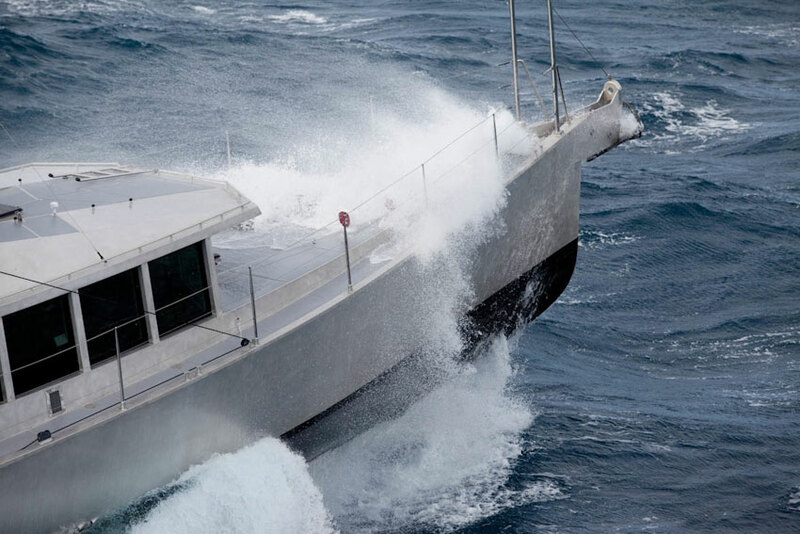 The FPB 64 has a out eight knots of true wind behind her and a four to six foot (1.2 to 1.85m) swell adding a little push. 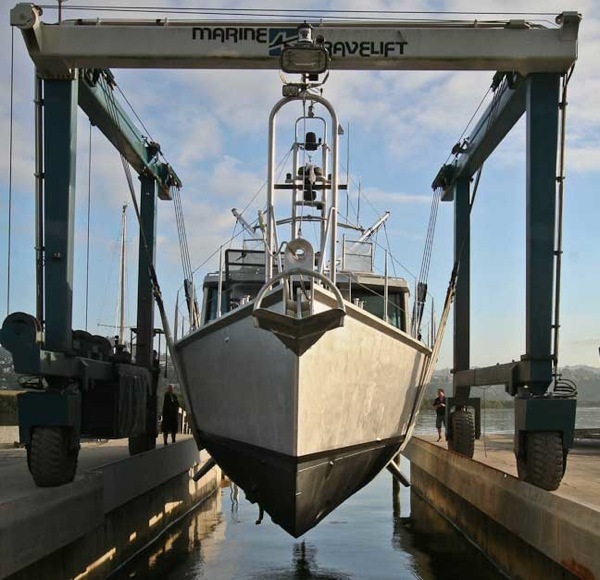 Docking a new boat for the first time in a tight marina is always going to increase the blood pressure a bit. Doing it in a 65 foot / 20m yacht in a fairway less than two boat lengths wide with a beam wind makes it even more interesting. Mike Parker is at the controls, and while he is an experienced boat and sailplane driver, the tension shows (the public was watching). We are starting to work on the Owner’s manual, the first section of which is about the fuel system. 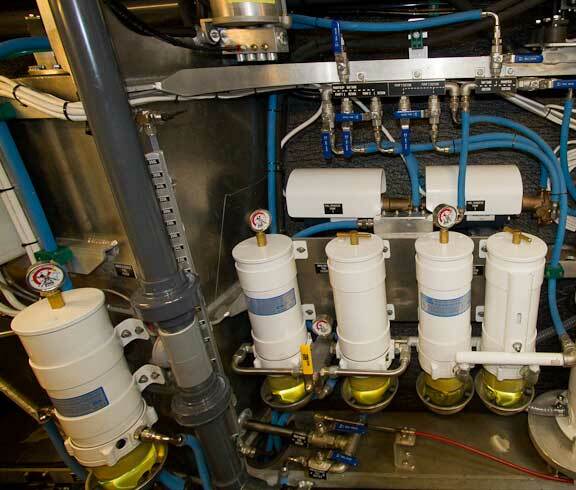 As we have been taking photos we thought you might like to see the completed system. Sunday we commented on the time it had taken to program the Maretron system. The data indicated was in error. It appears that Circa has spent around 40 hours so far on the programming. We have all four sets of FPB 64 Owners here now, plus three visitors who are thinking about joining us, all of whom have flown long hours for the experience. It has been a busy time for all of us. Yesterday we concentrated on learning about close quarters maneuvering and checking motion characteristics in short chop. 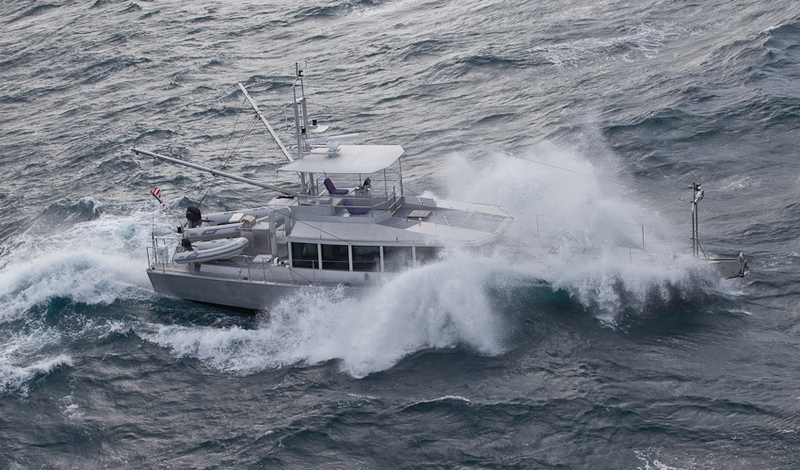 We’re starting to get into the meat of the sea trials, checking cruise speed against RPM, fuel burn rates, and motion. The screen above is one of 16 available from the NMEA 2000 Maretron display. 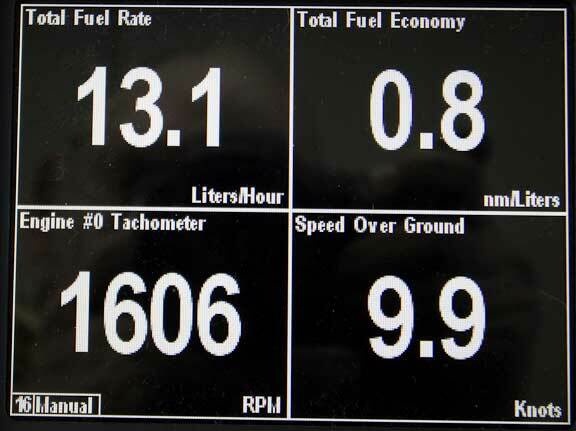 This system is tied to the Deere engine monitor and amongst other things shows fuel burn, mileage, and in this case engine RPM and speed over ground from the GPS. Of particular interest is the fuel burn data. 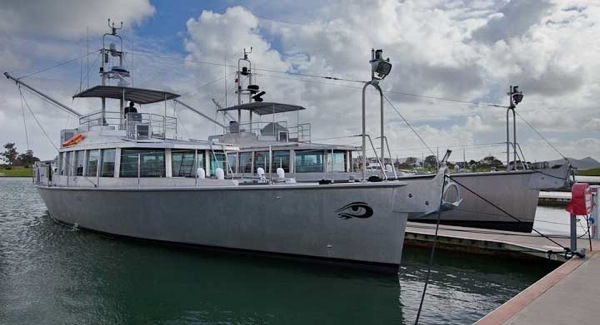 Although the bare aluminum exterior is functional it also works aesthetically. 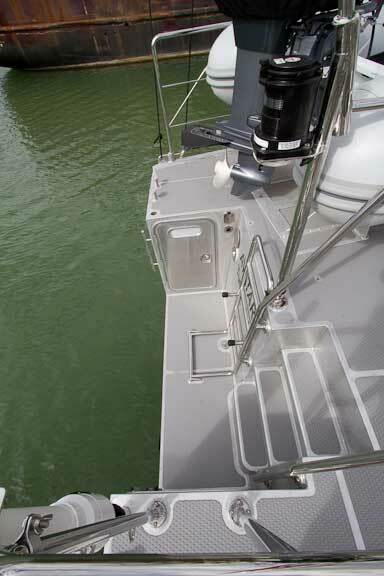 One of the keys to this are stainless steel details which offset the bare aluminum. As Circa have their own stainless fabrication facility, it provides a wonderful opportunities to demonstrate their prowess in this regard. 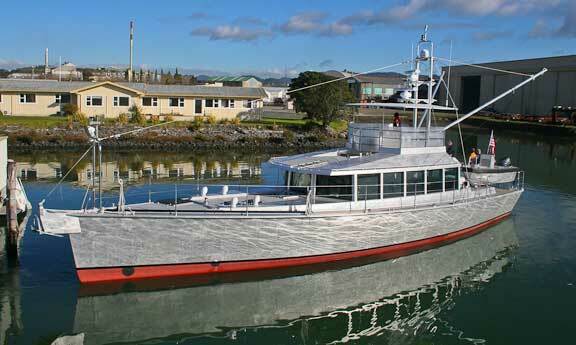 The first FPB 64 carries a 13 foot long by 6.5 foot wide inflatable. 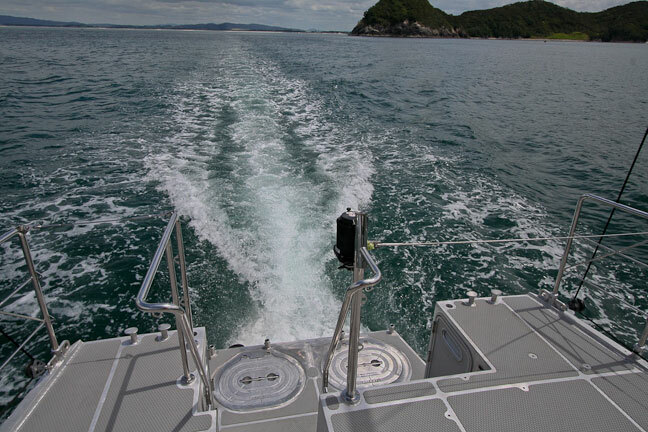 Powered with a 50HP Yamaha it has the space and grunt to carry four divers and their gear at speed to distant dive spots. 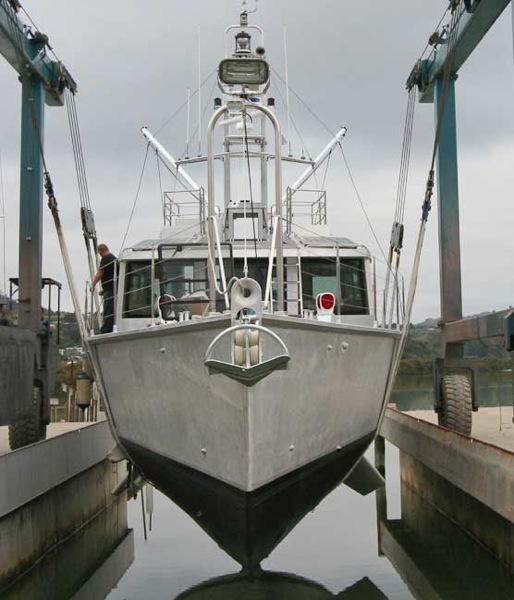 But how does it work with aft deck layout, and during launch and retrieval? Lindsay Turvey sent us this photo of the first time away from dock for Avatar (years ago Lindsay took part in a Queen’s Birthday storm rescue and sent some amazing sea state photos which are in Surviving the Storm). 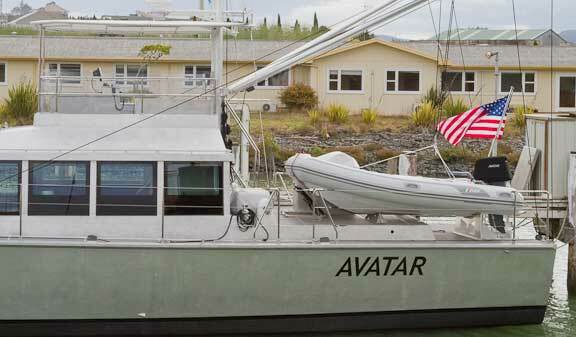 The FPB 64 is obviously floating high, but is she high enough? 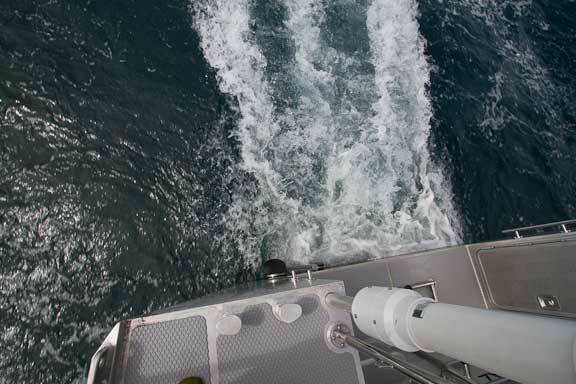 Although we have many tools with which to analyze design efficiency one of our favorites is looking at the bow and stern waves. This has to be done in the context of the design objectives, hull loading, and speed length ratio at which the hull is running. 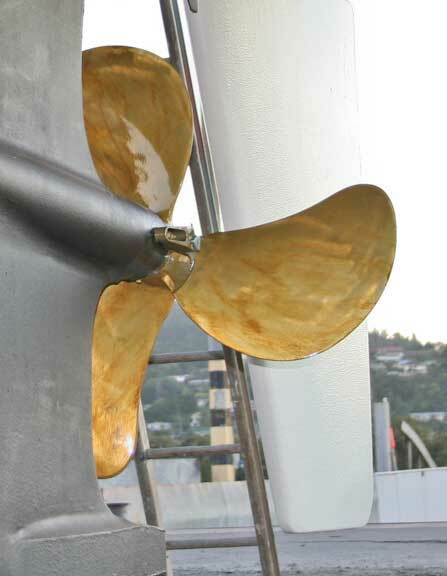 There are numerous propeller variables in displacement yacht design. 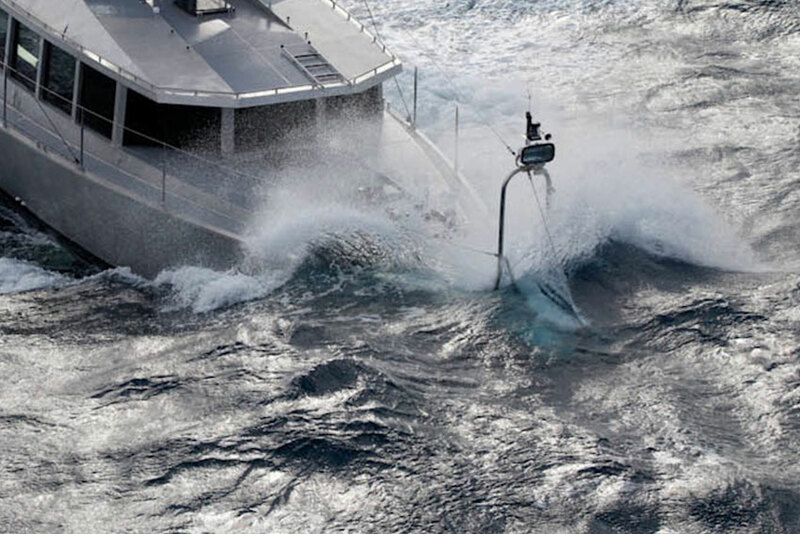 Given the restrictions of draft, and the massive drag to be overcome with most ocean crossing yachts, props are forced into a predictable pattern. 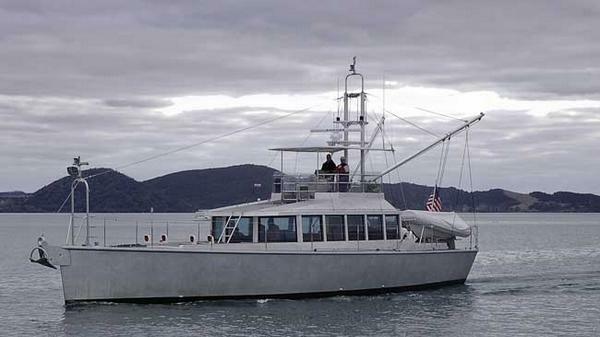 However, the efficiency of the FPB, and the low cruise power needs, allow a variety of options.